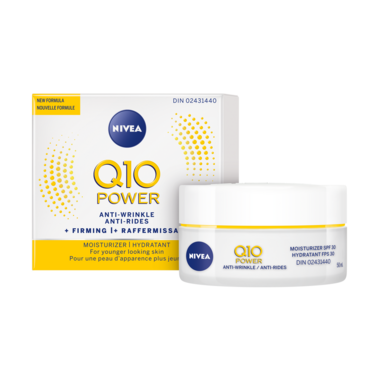 NIVEA Q10 POWER ANTI-WRINKLE +FIRMING SPF 30 Moisturizer combines antioxidant Q10 with 10X more Creatine* to visibly reduce fine lines & wrinkles, leaving skin looking firmer. 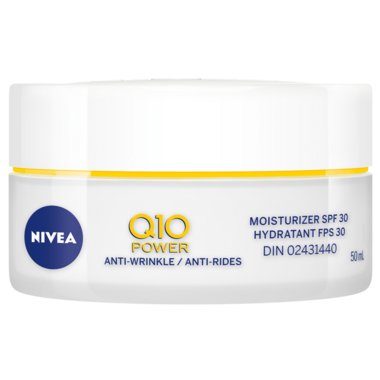 *compared to previous formula"
Visibly boost your skin's own anti-wrinkle power! SPF 30 with UVA/UVB helps protect the skin against sunburn. I like this cream, it's very light and has a nice smell. Only using this product for a few weeks now but the texture is wonderful, light and not greasy. Lovely light smell and feels great on the skin. Have tried many face creams but this is one of the best.